An 18-year-old, previously healthy female, presents to the Emergency Department with nausea, vomiting, and tremors. She states 45 minutes ago she ingested an unknown number of diphenhydramine tablets (25 mg) in a suicidal gesture. Past Medical History: Depression, Medications: none. Social History: As per family member, she does not smoke or use illicit drugs. She is single and unemployed. Vital Signs: HR 110 bpm, BP 151/92 mmHg, RR 20 / min, Temp 38.5 degrees Celsius. Physical Exam: General Appearance: Mild distress, awake, appears to be hallucinating. Eyes: Dilated pupils bilaterally but reactive. Cardiovascular: Tachycardic, normal sounds, and no murmurs. Lungs: Clear to auscultation bilaterally. Abdomen: Soft, non-tender, non-distended, decreased bowel sounds. Neurologic: Normal motor power, normal cranial nerves, normal cerebellar exam, alert and oriented to self. Not oriented to location or date. Attention level waxes and wanes. Skin: warm, dry, no rash. Musculoskeletal: No deformities, no clonus, normal deep tendon reflexes. The initial approach to any patient presenting to the emergency department begins with airway, breathing, and circulation (the ABC’s). The physician can proceed to a more thorough history and physical examination after the ABC’s are secured. Oftentimes, patients who present after an overdose have altered mental status or try to conceal their ingestion. This highlights the need for the physician to gather collateral history from Emergency Medical Services (EMS) providers, bystanders, family, and friends. The physician should try to find out if the patient has any psychiatric history or access to medications. The physician should check the patient’s clothing for empty bottles or paraphernalia of drugs of abuse. The physician should also inquire about the physical environment where the patient was initially found. 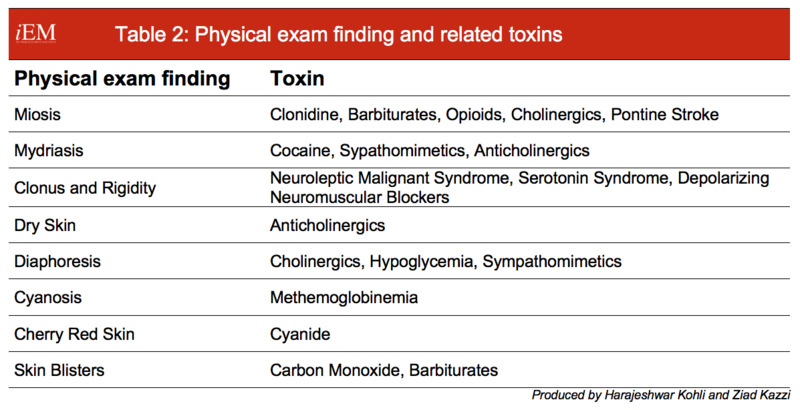 Various environmental toxins can lead to altered mental status and should be considered in the initial assessment. For example, carbon monoxide released from a defective space heater or electrical generator can cause altered mental status. Remember to always check a glucose level in an altered patient! Serum salicylate levels are frequently obtained in overdose patients although salicylate toxicity can be suspected on initial clinical examination. Urine drug screens are not useful in the initial clinical assessment and management of overdose patients because they are not able to detect a large number of drugs and can have false positives. For example, cocaine metabolites are detected for 3 days after use, synthetic opioids like fentanyl are not detected on routine urine drug screens, and pseudoephedrine produces a false positive screen for amphetamines. Urine drug screens are often requested for the psychiatric evaluation. If a patient has altered mental status, always initially check a blood glucose level and consider empiric administration of dextrose, naloxone, and thiamine in the primary exam along with ABCs.. The physician should consider a non-contrast Computed Tomography scan of the brain to exclude intracranial pathology. 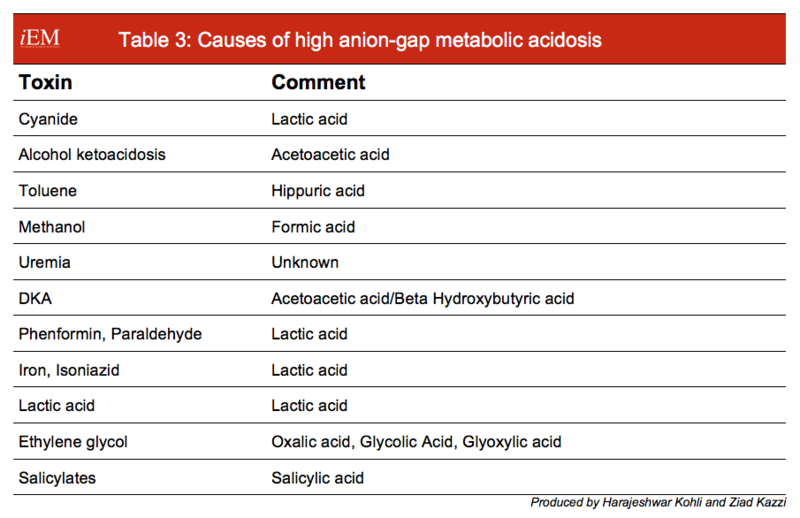 An Arterial Blood Gas can be helpful to evaluate acid/base status, and co-oximetry can assess methemoglobin (MetHb) and carboxyhemoglobin (COHb) levels. If toxic alcohol ingestion is suspected, serum levels for methanol or ethylene glycol can be obtained but are not readily or rapidly available. Measured serum osmolality can be obtained to calculate the osmolar gap, which is the difference between the measured osmolality and calculated osmolarity (= 2Na + BUN/2.8 + Glucose/18 + Ethanol/3.7). A normal osmol gap is between -12 and 10. An elevated osmol gap can be caused by methanol, acetone, ethanol, mannitol, sorbitol, isopropanol, lactic acid or ethylene glycol ingestion. Additional diagnostic tests and imaging should be considered based on the history and presentation. For example, an EKG can be ordered to assess the impact of a certain drug on heart rate, rhythm and interval length. A chest radiograph can be ordered to assess for pneumonitis after an ingestion or inhalation. An abdominal radiograph (KUB) can help identity radiopaque ingestions, including calcium carbonate, chloral hydrate, heavy meals, iron, phenothiazines, enteric coated and sustained released drugs (mnemonic CHIPES). Always consider consulting a clinical toxicologist or a poison center for assistance with managing toxic overdoses. 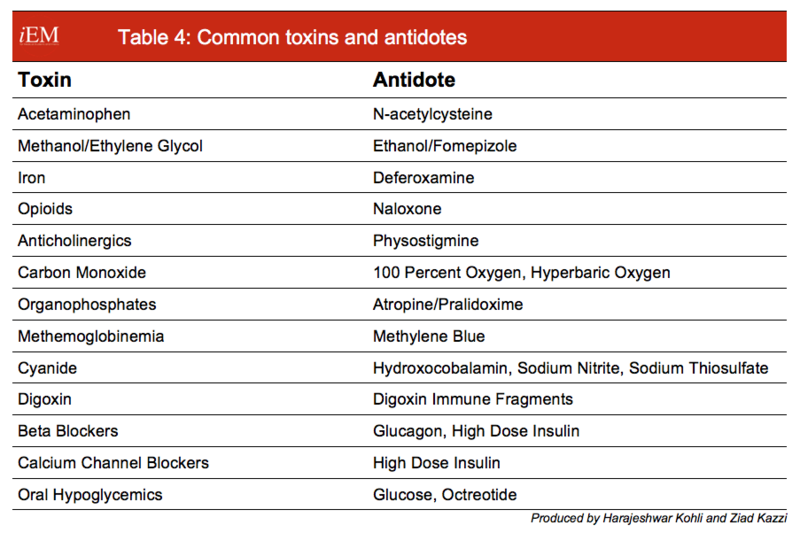 A few common treatment modalities and antidotes will be outlined below. Can be used for ethylene glycol, methanol, isopropyl alcohol, salicylic acid, and lithium. Best with small-sized substances that are not protein bound and that have a small volume of distribution. Vale JA, Kulig K; Position paper: gastric lavage. American Academy of Clinical Toxicology; European Association of Poisons Centres and Clinical Toxicologists. J Toxicol Clin Toxicol. 2004;42(7):933-43. Chyka PA, Seger D. J Toxicol Clin Toxicol. 1997;35(7):721-41. Position statement: single-dose activated charcoal. American Academy of Clinical Toxicology; European Association of Poisons Centres and Clinical Toxicologists. Thanacoody R, Caravati EM, Troutman B, Höjer J, Benson B, Hoppu K, Erdman A, Bedry R, Mégarbane B. Position paper update: whole bowel irrigation for gastrointestinal decontamination of overdose patients. Clin Toxicol (Phila). 2015 Jan;53(1):5-12. Proudfoot AT, Krenzelok EP, Vale JA. Position Paper on urine alkalinization.J Toxicol Clin Toxicol. 2004;42(1):1-26.